You know her as Ariel, Disney's little mermaid. 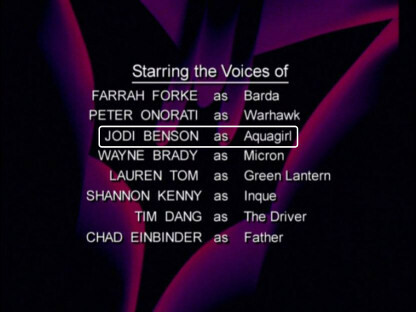 In addition to providing the voice of Disney's redhaired songstress though, Jodi Benson also performed the voiceover work for another aquatic adventurer. 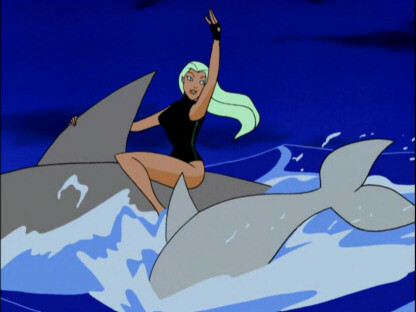 You may heard her performance as Aquagirl in two episodes of Batman Beyond ("The Call," parts 1 and 2). Her distinctive vocals closely resembled her normal speaking voice, and they were almost as enchanting as her singing. Oh, and just to prove that it was here, here's a screencap from the credits section of Part 1. Notice that a few other notables were also features, such as Wayne Brady and Farrah Forke.